After a Summer spent in “Lockdown”, Facebook apparently got quite a bit of work done. They’ve already had a number of events just in the past few weeks. And now they’re having another one. So what will Facebook be talking about? Who knows. The invite has chat bubbles on it, but as we’ve learned in the past, these often have nothing to do with the event. After Facebook’s last event, in which they unveiled some big updates to their Places product including Deals, we asked Zuckerberg if the company had any other big things to launch this year. He indicated that more was on the way, but at least one more big thing was coming soon. Is this the big thing or a smaller thing? Tune in Monday to find out. Update: Actually, looking at their icon again, you’ll notice it is their Inbox icon (at least on the iPhone) and not their chat icon. 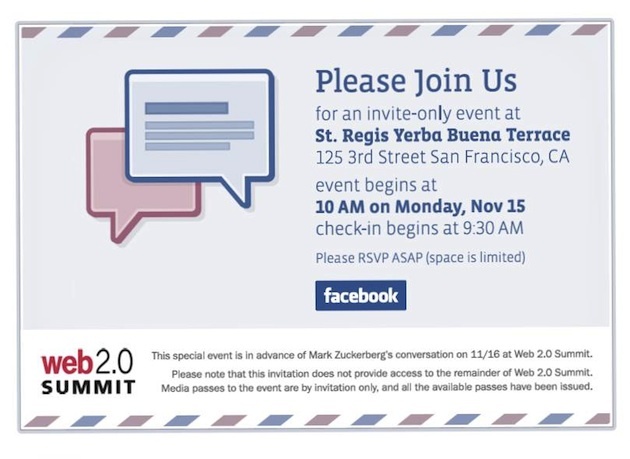 Could this be the unveiling of the new Facebook mail product — Project Titan? Let the speculation begin!